With solar batteries like the Tesla Powerwall starting to feature in the media it can be hard to get to the bottom of whether you should invest in solar batteries or not. This solar battery calculator, intended for those with a UK grid connection, can help show the likely benefit for your own solar system. You can use it to see how much you lose on your investment by buying solar batteries in 2018. It calculates how much of your own solar generated electricity you are able to store in batteries for later re-use. Use the sliders to adjust the calculator to reflect your own solar installation. The Energy stored per year data is calculated using a real 12-month period of solar generation to represent the day-to-day fluctuations in solar output throughout the year. The default positions are set for a typical 4kWh solar PV system with average output of 850kWh per year per kW of panel with 50% of generated energy available for export or storage for later use. We have assumed a 2kWh solar battery with a 5 year warranty and an installed cost of £2,500. Choose your solar PV system size in kW. Divide your total annual solar electricity output by your panel size. Or just adjust the slider until the generated per year figure in the right hand column matches your annual solar electricity output. Choose how much electricity your system exports to the grid. Choose the current cost of your grid electricity? Remember to exclude the daily standing charge from your costs. Choose how much energy your battery can store on one charge. Choose the warranty period of your battery. 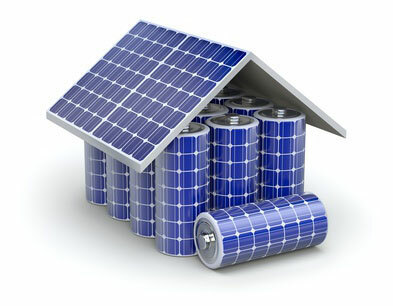 Choose the total installed cost of the solar battery storage system. Include all product and installation costs here, not just the cost of the battery pack itself. We would be delighted to get suggestions for improving this calculator via the comments section below. At the moment we assume energy prices stay broadly flat over the battery warranty period. Those who predict huge rises in electricity prices in the future may be right but on balance we think they are wrong. Cheap battery storage will be a game changer on energy pricing. Solar battery systems are quite quick to install; it’s best to wait until you make money today rather than buy on projected future energy prices. Battery prices are likely to fall in the next few years anyway; if energy prices double or treble then that’s the time to re-calculate the likely benefits. Below is a list of some of the solar battery products that are visible in the UK market. Estimated prices are the likely fully installed cost of a battery storage system using this product. These prices are different to headline prices of the uninstalled storage unit in isolation. We are happy to receive updates on prices as they fall. Hi, thanks for the calculator, I was looking for one of these recently and couldn’t find one as I have so far failed to make a solar battery make financial sense. From my figures, I obtain net zero ROI after 15 years on the system I was looking at and at the time, it would be about ripe for new batteries leaving me starting the ROI journey all over again. At the end of that second 15 year period where i’d be back to net £0, I would be end of life! So not much point yet. One factor that your calculator is not taking into consideration is time of day tariff shifting where regardless of solar generation, the battery could charge from a cheaper night rate and then discharge during the day offsetting the periods of high usage. I too believe that the right time is when further developments of battery store become available, the price is too high at present and I have installed a comprehensive monitoring system to obtain the very data that you mention people lack, i.e. full consumption data and full generation and export data as without it, I can’t really say what my surplus solar that could be diverted to a battery would actually be. Thanks for the feedback and suggestion for adding a night rate. I think this would be a very useful future addition as the domestic battery market develops. At the moment I haven’t really seen any significant signs of mainstream electricity supply companies offering this, although with the wider adoption of electric vehicles I can see this developing, as it will be sensible to offer off-peak times for vehicle charging. I will be looking to revamp the calculator in 2019, once government policy on export tariffs becomes clearer. At the moment the BEIS (Department for Business Energy and Industrial Strategy) are proposing to close the Feed in Tariffs (FIT) scheme from 1 April 2019 to new applicants. This currently includes export tariffs, which means that any householders exporting surplus energy to the grid from solar panels or storage batteries would not be paid anything at all for doing so (unless they had solar panels and a FIT agreement before 1 April 2019). For a department supposed to be thinking about energy strategy, this proposal by BEIS is nothing short of madness in my view. At the moment I am putting this down to the incompetence of a new minister wanting to make a name for themselves rather than a considered plan but we will have to wait and see. On the break-even point for investing in storage batteries for most domestic properties I think for most homeowners we are still a couple of years away. I have tracked storage battery developments for a number of years and now see signs of greater transparency and honesty about what these systems can deliver (financial returns, installation costs, warranties and realistic performance degradation). Much of it has been driven by developments in electric cars but a credible domestic storage industry will emerge in the next few years. I’m a little confused with some of it though. I’d like to be able to type in and see included the amount of electricity that the home consumes. Then I would expect that if I chose Export to grid: 0%, that all the energy generated would be available to offset the consumption amount. It would also be handy to set the feed in tariff rate in order to compare to battery saving. e.g: If I generate 1kWh in solar, I can sell it to the grid for 4p OR store it in the battery in order to save having to use it from the grid at a rate of 13p (9p better off?). Hi Tom, Thanks for the feedback and suggestions for improving the model. I would love to be able to include home consumption within this model but it maybe some way off as there are a few complications! One problem is that most people with solar pv (including me) don’t actually know how much electricity they use in their homes or export to the grid; unless they have the right smart meter. Non-smart meters normally show a) how much electricity they paid for and b) how much their solar pv generated. For some homes, 100% of the generation may have been used and for others 0%. No one can tell with the current metering arrangement. That’s why the feed in tariff scheme assumes 50% is exported. You would also need quite detailed daily metering data on probably 30 minute profile of usage versus generation and available stored electricity and remaining battery capacity; in essence one home’s usage profile during 24 hours could be quite different to another home; you may get too much generation at certain times which you can’t store or use. Currently the battery calculator reflects the existing feed in tariff (FIT) regime for domestic customers; in effect it ignores FIT as whether you store the electricity in a battery or export it to the grid makes no difference at all to the FIT payments you actually receive . If you exported 0% or 100% you would still get the export payment on 50% of your generation. That may well change with the widespread introduction of smart meters that can keep track of how much is actually being used rather than exported. The more exciting development will come if electricity companies offer low tariff electricity for you to charge your home and electric car batteries during the night, particularly during the winter months when your solar generation will be pretty low and the batteries hardly used for storage of your own generated electricity. if we can any government/electricity company initiatives in this area it could change things quite a bit.